To sum up, there are more than 25 different file types from different applications that Tipard iPhone Eraser can erase, such as Photos, Music, Videos, Contacts, SMS text messages, iMessages, Call History, Calendar, Notes, Reminder, Safari bookmark, iBooks, Podcast, iTunesU, TV Shows, Music Videos, Ringtones, Audio Books, Voice Memos, Apps. In addition, Tipard iPhone Eraser not only support to iPhone, it also support to on any iOS device, including iPhone XS, iPhone XS Max, iPhone XR, iPhone X/8/8 Plus, iPhone 7, iPhone 6s/6s Plus, iPhone 6/6 Plus, iPhone 5s/5c/5, iPhone 4s/4/3gs, iPad Pro, iPad Air/Air 2, iPad mini 3/2/1, iPad 4, the new iPad, iPod touch and more. Fill in the name and email address, and then click “Die konstenlose Lizenz abschicken (Send the free license)” button to proceed. An email will received containing with download link and register key code. 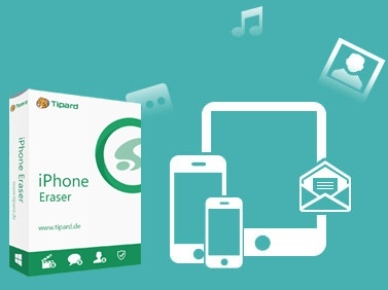 Follow email instruction to continue and enjoy the free Tipard iPhone Eraser.